Through the kindness of people who run rescue farms and ranches, visually impaired horses are given a second chance. Many of the animal rescues were abandoned, abused, underfed, and suffering from diseases related to malnutrition and neglect. Resources follow for anyone interested in caring, volunteering, adopting, or donating to organizations that help blind horses, and donkeys. BlindHorses.org. Operates Rolling Dog Farm, that cares for disabled dogs and horses. 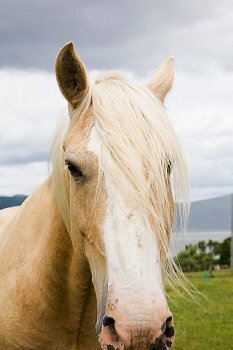 Provides information for owners of blind horses: how to care for a blind horse, eye diseases, myths, and what to do if your horse is losing its vision. Accepts donations. Located in Lancaster, NH. FlurrysHope. com. Second chances for blind horses. Rescue, how to care for blind horses, information about equine eye disorders, adoptions. The only rescue in the nation that rides blind horses. Accepts donations. Located in Madison, NC. Horse Net Horse Rescue. Non-profit, volunteer organization that operates on donations. Specializes in seniors and blind horses. Rehabilitation and rehoming of homeless horses. Located in Mount Airy, Maryland. Posted on August 1, 2013, in Animal Health and tagged blind horses, disabled animals, horse sanctuaries. Bookmark the permalink. Leave a comment.